My own religious views don't matter. As I've said, this story doesn't belong to me anymore, it's yours. 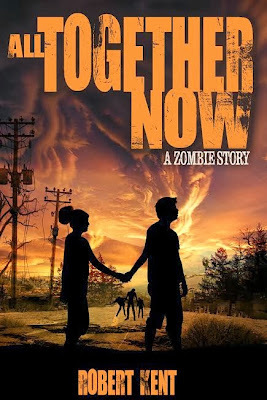 It's impolite to discuss religion and politics, but if an author is going to be polite, why bother:) Even so, I wouldn't discuss religion at all if it weren't so prominently featured in All Together Now: A Zombie Story. Perhaps you'll find it interesting to know that I very much believe in God (or perhaps you checked out during the first part of this ridiculously extended afterword and don't care). The older I get, the more I believe in something greater in the universe beyond ourselves. I've read Richard Dawkins, Bill Maher, and Christopher Hitchens, and they're all very smart guys. Hitchens, in particular, wrote and spoke in a manner that makes me long for such an apt capability in my own work (not likely). I don't have any special knowledge of the afterlife. It will either be a surprise or there won't be a me to know there isn't one, and I sure can't tell you with any certainty whether God's name is Jesus or Mohamed or Walter or George or Madame Rosita (please let it be that). I'm wary of folks who make such claims. I set my zombie apocalypse in a small Indiana town because I was once a teenager in a small Indiana town. Zombies are a lie, so I tried to tell the truth of the setting by writing what I know. And I'm telling you dead people rising doesn't happen in a small Indiana town without involving a church or two and a Wal-Mart. I grew up in the church and I appreciate it. The folks who brought me up were kind and friendly and they kept me from turning out to be a total jerk. I have fond memories of mountain backpacking with Christians, spelunking, going to church camp, and eating homemade meals at my minister's table. He and his wife are awesome. If I have one fear in publishing this book it's that old Sunday school teachers of mine will read it and think I don't appreciate the hard work they put into raising me. I love them and I'll forever be grateful for their kindness and decency. But I remember reading Pet Semmetary on a long bus ride home from a missions trip and being told to put it away and instead read the Bible. Later, I was again told to put down a nonfiction book of science and instead focus on a book of magical fairy tales. I was forced to sing songs programming me to think and act in a way deemed acceptable by others, and told horrific tales of hell way scarier than anything I've written to frighten me into submission. And I got off light. I had friends who were treated in unspeakable ways in the name of God. My family donates to Indiana Youth Group, an organization that provides shelter to LGBT kids who've been kicked out of their homes, usually for religious reasons. Religion is capable of turning parents against their own children in the name of interpreting the will of God, and any social tool with that kind of power should be approached with caution and skepticism. 1. I'm about to be a father and later I may lack the nerve to publish the daycare center stuff:) Thinking of how I might raise a child to adulthood has had me rethinking the manner in which I was raised. 2. I'm afraid I'm nearly completely conformed and zombified. Teenage Rob was certain I'd have set the world on fire by now with my storytelling, but it hasn't happened. After graduation, I had to get a job. It sucked, so I went to college and got a better job. I met the most wonderful woman in the world and we're having a child and would you look at that: I'm a conformed adult. I work hard every day doing something I enjoy, but it's not what I most want to do. I have to feed my family and that dictates much of how I behave and very little of my life is about choice. I'm doing what I have to do, which is how conformed adults roll (I have people I love and that makes it worth doing). This is probably the best afterward I've ever read. I was reading this book and I thought it was just a zombie book. A zombie book on the violent side. Me being me, I didn't even make the connection to conformity until the last chapter. I thought the cure was lame until I realized it wasn't the end and what the cure really did. The ending blew my mind. It paints conformity in a new light, perfect for high schoolers my age. Thanks so much for dropping by and reading not only my book, but all three parts of this afterword:) Authors love to hear from readers, so please continue to find the authors of the books you read and leave them a comment or drop a review. I prefer the second ending, but I dig the first one, even if it's only fleeting. I'd like to say more, but I don't want to spoil the book for people who read this afterword and not the book--that's a strange thing to do, but probably happening:) So I'll just say thanks again.